Despite its age, the PC remains central to the way that Central Banks attempt to control inflation. In most advanced economies wages are the most important component of domestic costs, so stabilising wage inflation should be sufficient to stabilise price inflation. In turn, the PC says that stabilising wage growth can be achieved by stabilising unemployment. So to meet an inflation target, Central Banks just need to change interest rates to keep the economy growing steadily and prevent unemployment getting too high – or low. Reality is rarely that simple. Central Banks often face external cost shocks, such as large movements in commodity prices or exchange rates, which can move inflation and unemployment in opposite directions. In this case, Central Banks face a ‘trade-off’ between stabilising inflation or unemployment. The PC determines the terms of that trade-off. A number of economists and policymakers have argued that the PC has become flatter or disappeared – in other words, a given change in unemployment has less effect on inflation. There could be a number of reasons for such a ‘flattening’: changes in the labour market, greater integration of the global economy or more credible policy frameworks. If true, this flattening in the Phillips Curve may be a mixed blessing. On the one hand, a shock to the economy that changes unemployment will not move inflation too far from target. Set against that, trade-offs are more painful when the PC is flat. Suppose inflation is high because the exchange rate has depreciated. With a flat PC, bringing inflation back to target would require a larger increase in unemployment. Regional data can potentially be a helpful source of information about the stability of the PC, and has been used to analyse this question for the US (as well as other questions about the labour market). It provides more data points, making it easier to look for changes in parameters. And regional variation can be used to explore potential reasons for changes. In this post I investigate what regional data for the UK can tell us about how – and why – the PC may have shifted in the UK over the past 20 years. Has the Phillips Curve remained stable in the UK? Phillips Curves are normally estimated on macroeconomic data for wage growth and the unemployment rate at a national level, but the same principal can be applied to regional level data, using panel techniques. 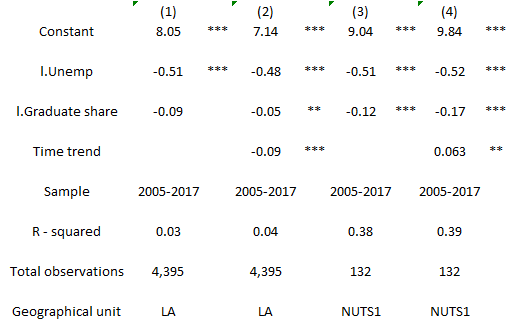 Figure 1 shows the results of fitting a simple Phillips Curve relationship for the UK using either Local Authority (LA) level data (column (1)) or NUTS1 level data (which divides the UK into twelve nations or regions – column (4)), using a fixed effects panel estimator. The growth rate of median hourly wages is negatively affected by the rate of unemployment in the previous year; an increase in the unemployment rate of 1 percentage point results in wage growth that is roughly 0.5 percentage points weaker. All regressions estimated on annual data, and include geographic fixed effects. Wage growth is median hourly wages for full-time workers, resident basis for LA, workplace basis for NUTS1. *** Significantly different from zero at 1% probability **5% probability * 10% probability. Are these parameters stable over the sample? Whether the level of the PC has changed over time can be tested by including a time trend in the regression, as shown in Columns (2) and (5) of Figure 1. The trend is negative, and highly significant. Over the sample, the same level of unemployment has been associated with lower wage growth. An alternative model, which allows a discrete shift in the PC, finds a lower level after the crisis than before. Columns (3) and (6) look for evidence that the curve has become flatter, instead of (or in addition to) moving downwards, by allowing the coefficient on unemployment to change over time. The results indicate that, if anything, the slope of the Phillips Curve appears to have trended downwards (become steeper) over time, although the coefficient is very close to zero and not significant. Another way to assess whether the slope of the PC has changed over time is to use rolling regressions – estimating a PC over successively later samples and seeing how the slope coefficient changes, as in Leduc and Wilson (2017). Figure 2 shows the slope parameter of the PC estimated over rolling seven year periods, and how this estimate has changed over time. The curve appears to steepen during the financial crisis; indeed it is difficult to find a downward slope for sample windows prior to the crisis. This probably illustrates the effect of sample selection – it is difficult to estimate the PC over a period with no recession, even with regional data. β coefficient in regression median hourly pay growth = α + β* lagged unemployment rate + θ*lagged National CPI Inflation rate. Dotted lines show 90% confidence interval around the fixed-effects panel estimate. Regressions estimated over 7-year overlapping windows, for instance 2017 values are estimated on 2001-17 data. There is some tentative evidence that the PC has become flatter over the past few years. However this could easily be the flip side of the same sample coin – as the Great Recession moves further into the rear-view mirror, it becomes harder to identify cyclical relationships. Overall there is stronger evidence for there being a drop, not a tilt, in the UK wage Phillips Curve. Why has the Phillips Curve changed? What could have caused such a drop? Slower productivity growth is probably part of the story. However, if aggregate productivity growth is added to the panel equations there remains a significant downward trend. Phillips Curve models often include a measure of the ‘unemployment gap’, instead of simply unemployment. The idea is that there is a ‘natural rate’ of unemployment – often termed the NAIRU, or U* – at which wage inflation should be consistent with the inflation target. U* is not directly observable; it can only be estimated. The evidence presented above – that the constant term in the PC has fallen – can be interpreted as a fall in U*. Why has U* fallen? As outlined in Saunders (2017), there are a number of possible reasons: changes to the benefits system, the rise of the ‘gig economy’, demographics (Tuzeman (2017)), inward migration, and the increase in educational attainment. Educational attainment is a particularly compelling candidate. Workers with more education have higher participation rates and lower unemployment rates on average. This could be for a number of reasons. Higher levels of formal education may make workers more effective at finding and applying for jobs; make it easier to make the transition into occupations or industries where employment is growing; or shift the mix of jobs in the economy towards occupations which are more secure. Regional data is well suited to testing the idea that higher educational attainment may have lowered U*. In Figure 3 I show what happens when a measure of educational attainment (the share of the population with degree-level education) is introduced into the Phillips Curve equations. Education seems to shift the PC downwards (see columns (1) and (3)). 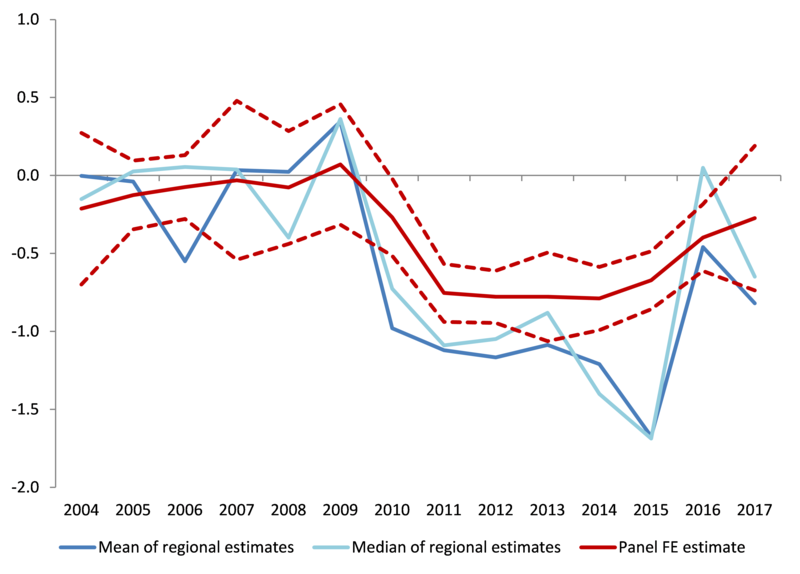 However, educational attainment increases in almost all of the Local Authorities and regions over the last 12 years, so the result may spuriously reflect a more general downward trend in wage growth. Columns (2) and (4) test this by including a time trend in the equations; although smaller, the effect of education remains statistically significant. Educational attainment also remains significant if productivity growth is included instead of a time-trend. Figure 3: has educational attainment shifted the Phillips Curve? This is a conditional result, which does not mean that education lowers wages. A more intuitive way to put it is that rising educational attainment has reduced U*, allowing for unemployment to be lower without causing wage growth that is too high for the inflation target. The net effect on wages could easily be positive. Based on the LA level results, rising levels of educational attainment can explain a fall in U* of around 1ppt over the last 12 years. The estimated effects are even larger with mean wages, or using NUTS1 data. Will U* continue to fall? Average levels of educational attainment in the workforce are likely to continue to increase over the next two decades. As older workers retire from the workforce, the average level of educational attainment for the workforce as a whole will increase, even without any further increase in the proportion of school leaves going to university. Figure 4 shows a projection for how the share of graduates in the workforce could progress, under a few other simple assumptions. If levels of education continue to rise as projected in Figure 4, then this should reduce U* by around ½ ppt over the next 15 years. Assumes that number of new graduations remains a constant share of the 21-24 year old population. Baseline projection assumes net migration is neutral for educational attainment. 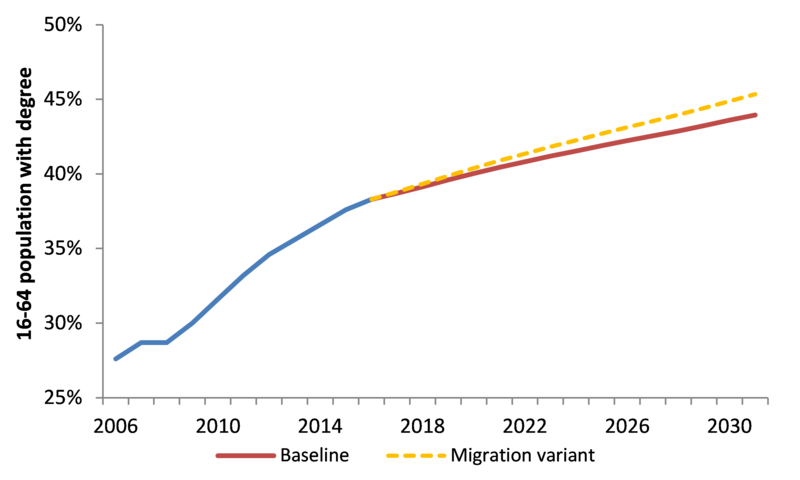 Migration variant assumes migration continues at levels in year to June 2017, and rates of higher education amongst graduates are as estimated in ONS analysis. Both projections assume mortality rates are equal for graduates and non-graduates. To summarise, analysis of regional data suggests that the Phillips Curve has shifted down in the UK – that is, U* has fallen. Higher levels of educational attainment can partly explain this downward shift. There is little evidence that the Phillips Curve has become flatter. Alex Tuckett works in the Bank’s External MPC unit. Previous Post What did the CBPS do to corporate bond yields?